Best Pet Carrier with Top Opening Door: Advice & Top Picks! 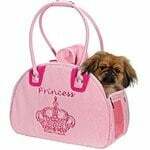 There are tons of different pet carriers to choose from for your dog or cat. From small and chic designer bags to carriers for larger dogs, many of the decisions you’ll face in selecting the right carrier will be based on your preferences. A carrier with a top-opening door is no different. When you think about the main components of a traditional carrier, there are two things to keep in mind: First, consider its safety features. What ‘extras’ does it have that will keep your dog secure, no matter where you go? Second, how convenient will it be for you? Both you and your pet should be comfortable when using a carrier. A top loading model takes both of those factors into consideration with the way it opens. You may not think something as simple as the way you put your pet into their carrier can make a big difference. But, it’s one more thing to consider in choosing either a soft-sided carrier or hard-traveling carrier. Your pet’s personality and what they feel comfortable with will make the decision easier for you. 1 Why Choose a Pet Carrier with a Top Opening Door? 2 What Is the Best Soft-Sided Top Door Carrier? 2.1 What Is the Best Hard or Plastic Top Door Carrier? 2.2 Are Top Door Carriers Good for Cats? 4 Should I Use a Top Opening Door Carrier? Why Choose a Pet Carrier with a Top Opening Door? This article will focus on a few of the best pet carriers you can purchase that feature opening doors at the top. Aside from personal preference, however, why should you consider this type of bag in the first place? We’ll focus on several reasons why your dog (or cat) may feel more comfortable being put into their traveling cabin this way. How your pet gets into their carrier may not seem like a big deal. If you have a dog or cat who struggles with their current carrier, or you’re trying to get them used to travel with you, this is one of the safest and easiest ways to make sure both of you are comfortable and calm. One of the biggest reasons people tend to choose a top loading option is because they’ve already experienced difficulties in getting their pet to go into a carrier with a front or side door. Dogs have different personalities. If your dog isn’t necessarily used to a crate of any type, they may get nervous or anxious being ‘shoved’ into a front-loading carrier. Dogs are den animals by nature. Many people assume that all dogs like being crated or confined. This isn’t true for every dog. For some, it takes a lot of time and effort for crate training. In many cases, it’s the dog’s anxiety that makes this type of training difficult. Too many people put dogs into carriers as a type of punishment. So, whether your dog already has a ‘bad opinion’ of front-opening carriers, or they are anxious about being put into a smaller space, you can remedy the situation with a top opening door. Carriers with this type of opening allow you to comfortably lower your pet into the cabin and secure the door at the top. They don’t have to feel as though they are being pushed into a new, confined space. This can help to lower their anxieties and make it less likely for them to try to get out of the carrier when you’re traveling. Most carriers can be ‘customized’ with your pet’s favorite blanket, soft padding, etc. You should think about the type of travel you’re planning on doing with your dog or cat when choosing a carrier of any kind. There are hard and soft carriers (both will be covered in this article). Which one you choose will greatly depend on how often you travel, the type of travel you’re doing, and your pet’s personality. Some dogs do better in a soft, comfortable environment. Others are too aggressive for soft-sided carriers and need a hard plastic crate to keep them safe. It may take a bit of trial and error to determine the best type of carrier for your pet. The good news is that the carriers listed in this article are budget-friendly and won’t break the bank. You can try more than one to determine which crate makes it easier to travel with your furry friend. What Is the Best Soft-Sided Top Door Carrier? There are many benefits to a soft-sided carrier or soft-sided crate. They are comfortable for your dog, they typically have a mesh lining that is easily breathable, and they are convenient to carry around with you. When you’re not using them, they also fold away easily. Soft-sided carriers may also help with your pet’s anxiety, as it provides an extra layer of comfort. Most are not only well-ventilated but heavily padded for extra cushion. It’s a good idea to look for carriers that have removable padded interiors. That makes them easier to clean if your pet happens to have an accident. One of the best soft-sided carriers that can be opened at the top is the Pawfect Soft Sided Travel Pet Carrier. While you can open it from the side, it also includes a full-zippered opening on top to lower your dog or cat in. It’s an easy carrier to sling over your shoulder, much like a backpack. It also meets most airline regulations and can fold flat when not in use. If you have a smaller dog that doesn’t show aggression when they are put in a crate of any kind, this is a great option. They’ll feel cozy and comfortable when they’re able to look around freely. Plus, it won’t be a chore to get them inside the carrier for a quick trip to the vet, or a long plane ride across the country. What Is the Best Hard or Plastic Top Door Carrier? For dogs who may be a bit more active when they are anxious, a hard-sided carrier is a good idea. 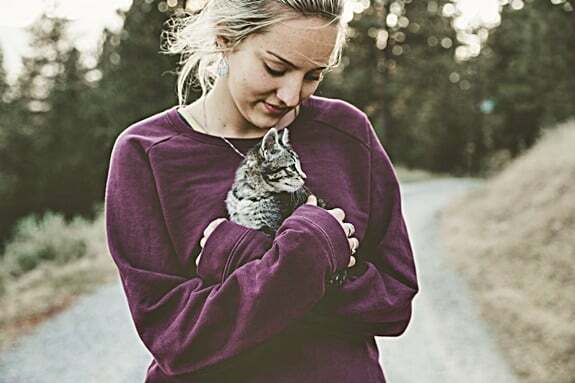 Soft carriers can be comfortable and durable, but some pets will claw or bite through the material. This is dangerous for your dog and can destroy the carrier in the process. A great way to keep your anxious pet both comfortable and safe while you’re traveling is to use the Petmate Two Door Top Load Pet Kennel. Not only does it offer multiple points of entry for your dog, but it will keep them protected even if travel gets a little bumpy. 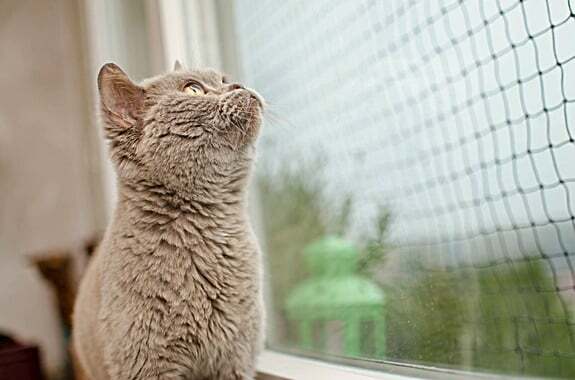 Because of its hard plastic exterior, your pet also won’t be able to claw or chew through it. The two-door option is great for determining what your pet might be more comfortable with. Some dogs have no problem going in through the front door. Others may be exceptionally anxious and need to be lowered in through the top. Because of the extra ventilation, it will also allow your dog to breathe freely and encourage the right amount of airflow, so they don’t get overheated. The Petmate carrier is designed for dogs up to 20 pounds. It makes traveling, even on an airplane, much easier. You can have peace of mind knowing your pet will be safe, and you can carry them around easily and conveniently. Are Top Door Carriers Good for Cats? Cats are somewhat notorious for being anxious at times. They typically don’t like to be confined in crates or carriers unless they are used to it. For some felines, even after years of being familiar with carriers, they still have trouble with anxiety. But, traveling with your cat can be just as important for some people as traveling with a dog. They are still a part of the family! When it comes to top loading carriers for cats, one of the best is the Sherpa Original Deluxe Pet Carrier. 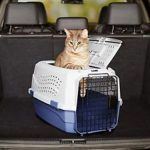 This carrier is airline approved, but is also convenient enough to be used for trips to the vet, going on a road trip, and more. There are three ventilated sides and locking zippers to ensure the safety of your cat wherever you go. 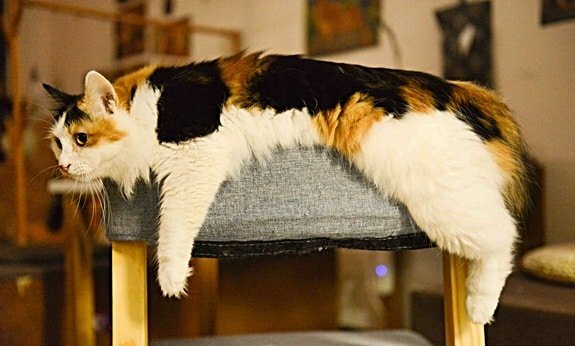 It technically isn’t a kennel, but if your cat becomes used to it, they may learn to treat it as their own little ‘home.’ For that reason, some owners leave the carrier out in their home so their cat can crawl into it for a nap whenever they’d like. If your cat starts to like the carrier that much, loading them into it for travel will be a breeze! The carrier itself is leak-proof, which is a huge bonus when you’re on the road. Even if an accident does happen, it contains a removable, washable liner. Whether your cat is anxious about travel or has no problem getting into a carrier, you can keep them safe and lower their anxieties with this top pick for a top loading tote. Never force your pet into a crate of any kind. Top door carriers make this easier, as most dogs and cats tend to be calmer when they are lowered into a crate rather than pushed into a front door. However, if you notice your pet is struggling, take a break before trying to get them in the crate again. Give them time to calm down. Hard carriers are strong and durable. They’re great for aggressive pets or those with extreme anxiety. But, they aren’t always as comfortable or inviting as soft-sided options. Be sure to put some kind of padding or cushion in the bottom of a hard crate to give your pet extra comfort. Make sure you can remove it to wash it as needed. To keep your pet from jostling around during travel or running out when the carrier is open, attach them to a tether within the crate. Most carriers include this type of tether, but if your dog seems extra anxious, you’ll want to make sure the carrier you choose has one. Always be calm with your pet when they are in their carrier. They’ll likely feel less anxious if they can see you and hear your voice. That’s why carriers with two doors or mesh paneling are great options. They won’t get too hot for your dog or cat, and they make it easy for your pet to see all around them. Should I Use a Top Opening Door Carrier? If you’ve tried traveling with your dog or cat before and have noticed they are anxious about their current front door carrier, a top door option could be a great solution. You could also choose a top door carrier from the start to get your pet used to it. They are designed with your pet’s comfort and safety in mind. But, they can also make the travel experience much easier for you as the owner. Once you’ve decided that a top loading carrier is easier on your pet’s anxiety, it’s a matter of choosing the right one. We hope the carriers listed in this article have given you a few tips on what to look for. Whether you choose a hard or soft crate will be dependent on your dog’s personality. The most important thing is choosing a carrier that will keep your pet well-protected throughout their travel experience. Keeping them safe during travel is the key point of a carrier in the first place. There is no reason why your pet shouldn’t be able to travel with you, even if they struggle with anxiety. By using one of these carriers, you can make the experience more comfortable for both of you.